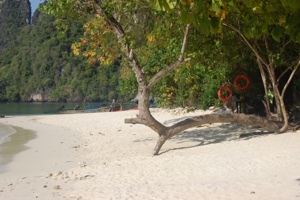 Early on Sunday morning we went down to our beach at The Tubkaak Krabi boutique resort. 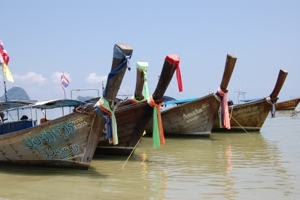 Where we found 2 long tail boats ready to take us on an island hopping trip. 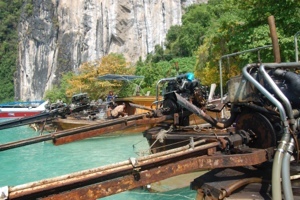 The boats are traditional wooden boats with huge what look like car engines on the back to drive the propeller. 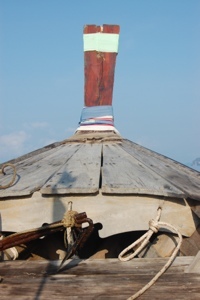 We clambered on board using the rusty ladder and off we went. My husband and I in one, and our boys and their girlfriends in another. Looking back we think one would have been enough, but we were concerned about having enough shade.The boats left the shore and we were off. The noisiest engine ever! The trip to Hong Island took about 20 mins and we were the first people to arrive. It was about 8.20am. Well worth the early start, to really see the island at its best. 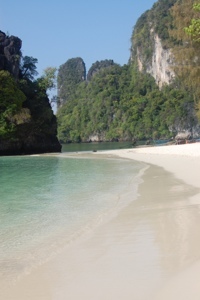 The water was clear and the sand was the best I’ve seen in Thailand. There is a small cost to come to this island as it is a national park. A huge array of fish were easy to spot in the sea and when the first tour boat arrived we saw even more! The group had sensibly brought sliced white bread with them which they kindly shared with us. The fish had a feeding frenzy. Eating straight out of our hands. Well I say our hands, I was a little freaked out and kept dropping the bread. We stayed on the island until 10am and by then large groups came and went. We were so thankful we were there so early. Would definitely go back if we get the chance one day. I would recommend. 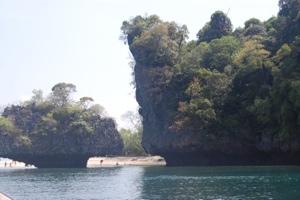 We then left and motored around the little islands until we came to another small beach where we snorkelled. Again very busy with motor boats this time but plenty of room to see more fish. 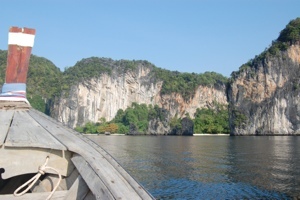 We then climbed back on the boat and went off to our final island when we arrived it was so busy we decided not to anchor there, and made our way home. A really perfect day. 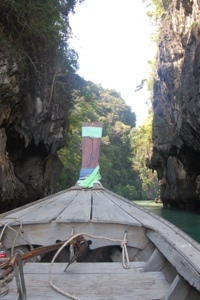 Well worth the 2000 baht for the boat. Second boat slightly cheaper. 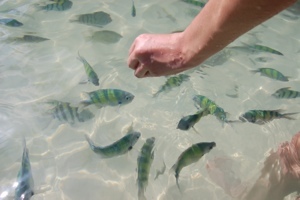 Hope to return one day to Hong island and feed the fish. Hopefully I will be a little braver.